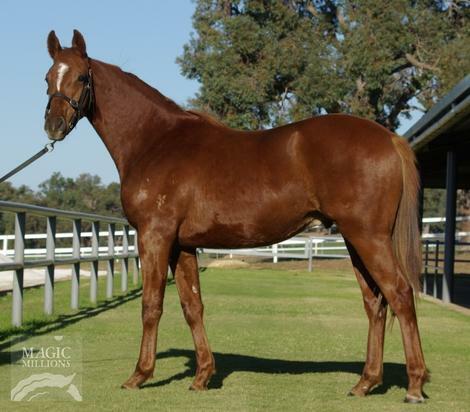 FROST GIANT (USA) (Chestnut 2003-Stud U.S.A. 2009, Aust. 2013). 4 wins-1 at 2, Belmont Suburban H., Gr.1. Half-brother to SW Breathless Storm. Sire of 270 rnrs, 160 wnrs, 12 SW, inc. Giant Expectations (Del Mar Pat O'Brien S., Gr.2), Valour Road, Thermistor, Frost Wise, Lover's Key, Miss Freeze, Frosty Margarita, Loki's Vengeance, Comandante, Frosty Bay, Kelli Got Frosty, West Hills Giant, SP Giant Finish, Bobby on Fleek, Frosty Gal, etc. JOBETH, by Johannesburg. 7 wins from 1500m to 2100m, A$185,610, WATC Westspeed 3YO H., Albany Cup, WATC Tabozbet.com.au H., 2d WATC Robyn Piper-Macdonald H., Playeronline.com.au H., 3d WATC Carbine Club WA Apprentice Cup, Westspeed Stayers' H., National Jockey Day H., Budget Truck Rental H. Dam of two named foals, one to race. Jobeth. 7 wins. See above. Robabank. Winner at 1600m in 2016-17, 3d Ipswich TC Sky Racing P.
Prinsipe. 6 wins from 1400m to 2200m in Aust. Bettsie. 3 wins from 1500m to 1850m in Aust. Zanhooves. 3 wins at 1600m in Malaysia. A Little Divided. Winner at 1300m in Aust. Mr Epic. 9 wins-1 at 2-from 1200m to 2000m, A$690,700, to 2017-18, BRC Powertrain 3YO P., Adrenalinethoroughbreds.com.au H., Programmed Property Services H., DA Ernst H., GCTC NHP Electrical Products H., Qld Tatt's RC Allan Rohde 60th H., BRC Trackside Open Air Cinema H., Hughes Equipment Hire 2YO P., 2d BRC Help Enterprises H., SCTC Stanley River Thoroughbreds H., 3d BRC Membership H., Mother Mary Magdalan Burke H., Brett Whalley & Co H., GCTC Haymans H., Ipswich TC XXXX Summer 2YO P.
Blackjack Princess. 3 wins from 1350m to 1650m, Ipswich TC Ray White H.
Lara's Glitter (Don Eduardo). 4 wins from 1600m to 2050m, A$92,260, 2d TRC Hobart Guineas, L, MVRC Tatt's 2YO P., 3d MRC Snowing 2YO P., 4th Tasmanian Derby, Gr.3. Producer. BAHANA (Elusive City). Champion Stayer in Singapore in 2016. 7 wins from 1400m to 2200m, S$1,276,307, Singapore Gold Cup, L, Singapore TC El Dorado Classic, L, Solutions S., Class 3 H., Initiation P., Philanthropy S., Class 4 H., 2d Singapore Gold Cup, L, Singapore TC Class 4 H.-twice, 3d Singapore TC Captain Obvious S., Mr Big S.
La Mouline (Showcasing). 6 wins to 1400m, NZ$8,000, A$142,480, to 2017-18, WATC South African Airways H., Tourism WA Trophy H., My Rentokil H., Tabtouch H., JJ Richards & Sons P., 2d WATC Hosemasters H., 3d Taranaki 2YO Classic, Gr.3. TOP OF MY LIST (High Chaparral). 4 wins from 1300m to 2000m, A$275,210, to 2016-17, ATC Japan Racing Association P., Gr.3, Lord Mayor's Cup, L, Pluck at Vinery P., Pluck at Vinery H., 2d ATC Schweppes H., TAB Rewards H., 3d ATC Epona S., Gr.3. Sparkling Special. 3 wins at 1600m, 1800m, AJC Phillip Coles H., NSW Tatt's RC Hermes Silk H., 2d STC Ajax H., 4th AJC Adrian Knox S., Gr.3. Producer. EMPIRE GOLD - PLASTIC POLYMER (H.K.) (Second Empire). 3 wins from 1600m to 2050m, A$77,600, HK$2,166,000, HKJC Centenary Vase, L, 2d South Australian Derby, Gr.1, HKJC Yuen Long H.